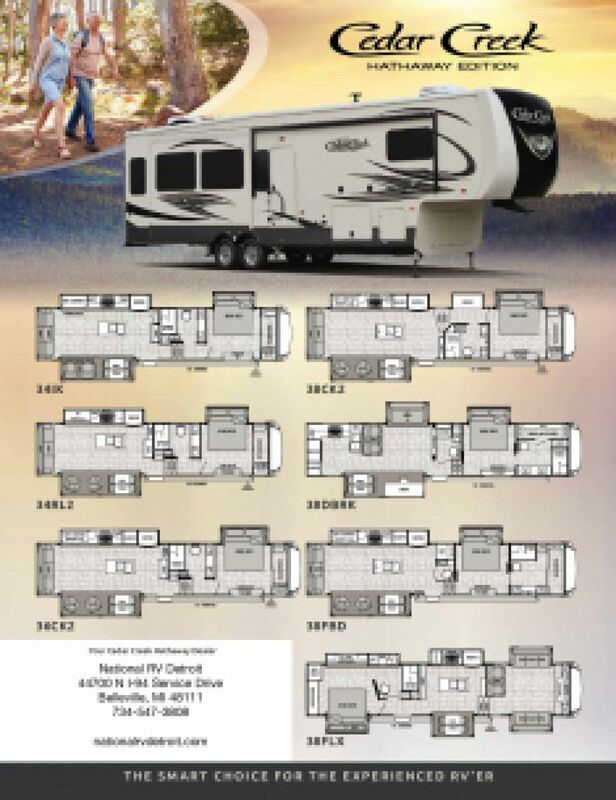 Journey across the country in style and comfort with the 2019 Forest River Cedar Creek 36CK2 5th Wheel! At National RV Detroit in Belleville, Michigan, we are one of the nation's top full-service RV dealerships, and we've been selling all of the top brand RVs since 2008! For an amazing deal on a new or pre-owned RV, we can't be beaten! So go online and check us out, then come in and let us help you find the perfect RV for you and your family! We're conveniently located at 44700 N I 94 Service Dr Belleville Michigan 48111, and our friendly, courteous staff are always ready to assist! Even if you don't live in the Belleville area, or in Michigan at all, we offer personalized phone and internet service, and our 24/7 delivery anywhere in North America means you can buy your dream RV today at a dream price, and have it delivered to your door tomorrow! Give us a call at 734-439-3400 and we'll turn your dream into a reality! This model is very road manageable, with a hitch weight of 2525 lbs. The retractable 18' 0" patio awning reduces wind resistance while you're traveling, and the sturdy GVWR of 16525 lbs. means years of camping fun for the whole family. 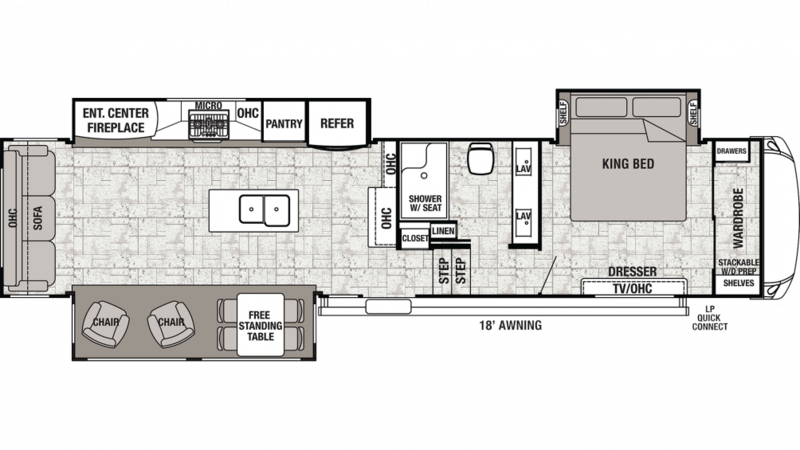 Looking for a spacious and roomy RV for you and your family? Look no further! This model is 40' 7" long, 8' 0" wide, and has even more living space when you slide out the 3 slides! The 15000 BTU a/c and the 35000 BTU furnace help the interior maintain a stable temperature, even if the temperatures are at extremes outside! Nothing tops off a great day of outdoor fun like a good night's sleep! That's what you'll enjoy every night in the handsome master bedroom with its regal King bed! So roomy and comfortable you'll drift off to dreamland before you know it! There are sleeping accommodations for up to 4 inside this RV! Use the kitchen's 3 burner range cooktop to cook up incredible dishes! The kitchen also features a roomy 18.00 cu. ft. refrigerator and a sink with clean drinking water from the 57 gallon freshwater tank! Even after days on the campground, you can enjoy a hot shower thanks to the heat provided by 60 lbs. of LP tank capacity! The bathroom has a convenient Porcelain Foot Flush toilet, and dirty water is sent to the 80 gallon gray water tank and the 40 gallon black water tank.